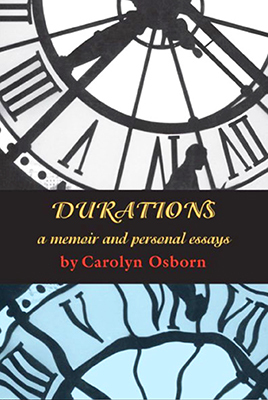 I reviewed Durations: A Memoir and Personal Essays (Wings Press) by Carolyn Osborn for Lone Star Literary Life. This is a valuable account of growing up against the backdrop of WWII by a Texas literary treasure. Carolyn Osborn is a grande dame of Texas letters. She has won awards from PEN and The Antioch Review, and the Lon Tinkle Lifetime Achievement Award from the Texas Institute of Letters. Several of her short stories have been anthologized, including in The O. Henry Awards (Doubleday, 1990) and Lone Star Literature (Norton, 2003); she is the author of four short story collections and two novels. Durations: A Memoir and Personal Essays is Osborn’s newest book. “Durations” is a recounting of her childhood in the United States during World War II, and the volume includes seven recent essays; several of these works have been previously published in various forms in such journals as the University of North Texas’s American Literary Review and Southern Methodist University’s Southwest Review. Osborn’s mother suffered, unbeknownst to Osborn, from schizophrenia and was hospitalized while Osborn’s father was away training troops. Osborn and her brother were taken in by the aunts of their extended Southern family, but lived in different households until the end of the war when their father remarried, and the family regrouped and decamped for Texas. I was lucky to hear Osborn speak passionately about mental illness at the Texas Book Festival this year, about the necessity of talking about it openly and without shame, banishing stigma. Osborn didn’t talk to her mother or see her again until she was a grown woman with children of her own, a heartbreaking and unnecessary tragedy. A series of vignettes firmly grounded in the alien atmosphere of a country at war (“a vast and terrible confusion that had already hospitalized my mother, divided my brother and me, and threated to kill my father and uncle”), Osborn’s account of her early life playing out against the backdrop of world history is moving and important. These are valuable memories of a generation that will be lost to us in the not-too-distant future. Osborn has an understated style that speaks volumes. Osborn’s frequently funny (“I learned I was morally lacking in many ways but I tended to forget which ones”); astute (“She was personally as antiseptic as her always clean white uniform”); and observant (an aunt’s suitor had a “beseeching face, making him look as if you knew the answer to something he needed to know”). The essays following “Durations” address the everyday mundane and everyday extraordinary in a wide range of subjects, from guns to Hill Country ranching to ambivalent travel essays, evidencing a naturalist bent. These are a gentle read, musing and insightful. Osborn learned the art of storytelling from her aunts. We can thank those steel magnolias, “curiosity, that great provoker,” and “whim, that small action that changes everything,” for the gift of Carolyn Osborn. TexasBookLover Named a TOP 50 TEXAS BLOG!